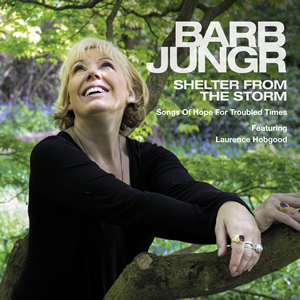 Élan, intelligence and passionate engagement: British chanssonier Barb Jungr brings all of it to her exemplary performance on Shelter From The Storm – Songs of Hope for Troubled Times. I can think of no one else to have sung these modern classic songs just so. Jungr’s enunciation of the text of each by such celebrated lyricists as Bob Dylan, Joni Mitchell, Stephen Sondheim, Leonard Cohen, among others, has crystal clarity, while her singing runs the full gamut of emotions from the aching lyricism of ‘Sisters of Mercy’ to the elated peroration of David Bowie’s ‘Space Oddity’. As much as Barb Jungr’s magnificence is in evidence throughout this programme, Laurence Hobgood is an immaculate accompanist as well. His performance shows a particularly clean set of fingers in the dashing virtuosity of the original composition (by Jungr and himself) ‘Hymn to Nina’. The album’s settings are acutely sensitive to word and situation, through-composed in operatic fashion, with meaning dictating structure rather than vice versa. This cycle of songs deserves wider exposure in recital as well. The accompaniment of this trio is noteworthy for another reason: it is so rounded and distinctive that in many ways it makes the vocals of Barb Jungr sound like a series of arias without the orchestra. Jungr shows technical accomplishment comparable to the finest singers – Barbara Hendricks comes immediately to mind. It is easy to admire Jungr’s complex manipulations of this beautiful material translates into a new stylistic language. There is an impressive culminating effect when her voice and bass and piano come together on track after track. Bassist Michael Olatuja is one of the most melodic bassists as this fare will testify and there can also be no better percussion colourist than Wilson Torres. But the recording belongs to Barb Jungr, whose cornucopian invention makes this a stellar and unforgettable disc. The audiophile nature of the recording enables you to virtually recreate in your living room the dynamic sound of the music in performance right down to the finest details. Track List: Bali Ha’i; Stars Lazy But Shining; Shelter From The Storm; Sisters of Mercy; Venus Rising; Something’s Coming; Woodstock; Hymn to Nina; All Along The Watchtower/In Your Eyes; Life on Mars?/Space Oddity. Personnel: Barb Jungr: vocals; Laurence Hobgood: piano, keyboards and whistling; Michael Olatuja: bass; Wilson Torres: percussion.